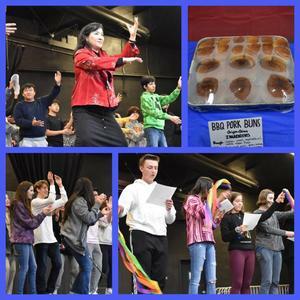 To celebrate the diversity and variety of cultures within CUHSD, the language programs atBranham High School hosted abanquet featuring more than 100 dishes from around the world. Students from all language classes were invited to the event, which highlighted music, dances, food and traditions. Event host Laurel Garceau, French teacher and department chair, opened the event, welcoming students and their families. Students enjoyed a variety of cuisines from across the world including North American, Middle Eastern, South American, Mexican, European and Asian. All the Mandarin students sang “Yellow” by Coldplay translated into Mandarin. Following their vocal performances, students performed tai chi for the crowd and danced to the popular song “Little Apple” by the Chopstick Brothers. Spanish classes also sang a variety of songs from the traditional “De Colores” song to “Vivir Mi Vida” by Marc Anthony.